While updating my Productivity Tech Tools workshop this week, I ran across the new-ish business card scanning feature in Evernote. Very handy, though only available onÂ iOS devices Â at the moment, with promises of Android sometime. With yourÂ iPad or iPhone Evernote app start a new note by selecting theÂ Camera option, then Â theÂ business card option. Point the camera at the card. Evernote will find the card, focus on it and take a photo of it without you needing to tap the camera button.Â Â Very handy if you’re trying to do this with an iPad. Evernote then parses out the data and gives you a screen of info about the person like the one at the right. 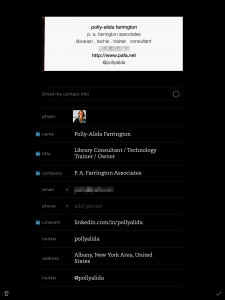 The contact info is usually displayed in the right data fields. Edit it if needed. If the person has a LinkedIn profile, that information will be included. It doesn’t do quite as good a job finding the person’s twitter handle. An image of the original business card is included. And you can add an image of the back of the card after you save the data. This video from Evernote shows the process. And best of all, the card data will also synchronize with your Contacts on your iOS device. You can do this on a case by case basis from the Options menu on the new note.Â IfÂ you want to automatically for sync all scanned business cards, follow these two steps. If you already have that person in your contacts, it doesn’t seem to merge them. This is also the screen where you can authorize access to your LinkedIn account and edit your own Contact Info. Next Next post: Edshelf can save your bacon, now help #saveedshelf’s bacon!